Take a proactive approach to safety with our mobile inspection checklist and enhanced work order generation. Prevent incidents before they happen! On-the-go incident reporting allows employees to report an incident from anywhere using their mobile phone. Unique, easy to use mobile check-in and check-out for contractors. Ensure the safety of your people by knowing where they are all the time. Leading Indicators are essential to keeping employees safe and preventing unnecessary costly injuries. Protect the ones who matter most and save on both direct and indirect costs by promoting a proactive attitude towards incident management. Enhance your risk mitigation strategy by conducting inspections and survey from the convenience of your mobile phone. With easy to use templates and a simple interface, create a new surveys or choose one from our extensive library. Generate Work Order triggers for your team to fulfill automatically as you go through the handy checklist. Welcome to the future of Safety Incident Reporting! The safety of employees and contractors each and every day is paramount to any company's success. When accidents happen, fast and accurate reporting is essential. mySafetyProfiler's SIR functionality allows for fast, data-integrated responses to even the most minor incidents. 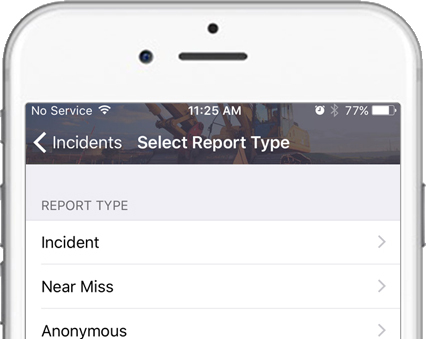 The easy-to-use mobile app ensures that all incidents are reported immediately so that Safety Managers can take immediate action. Reporting and documenting safety incidents isn't an option. It's a requirement. Empower your Safety Manager with the tools to verify and document all incidents effectively. With mySafetyProfiler, Safety Managers can quickly monitor and approve any reported incidents via a dashboard, eliminating costly and time consuimg paperwork. Should an unfortunate incident regarding significant loss, chemicals, or hazardous materials occur, immediate reporting to OSHA is essential. mySafetyProfiler alerts you in real-time of all such incidents preventing missed reporting deadlines and saving countless dollars in fines. 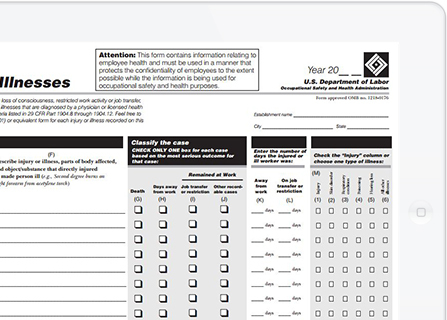 mySafetyProfiler's revolutionary OSHA form generator saves you time and money! 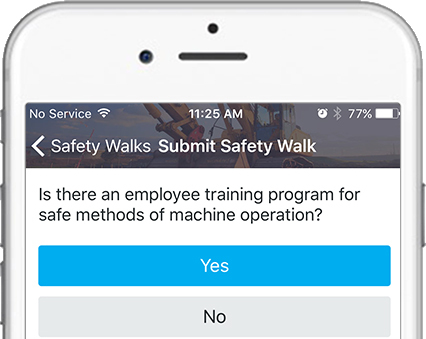 Once a Safety Manager has verified pertinent incidents, OSHA forms can be generated within seconds. No more paper clutter and wasted time figuring out which incidents need to be recorded. mySafetyProfiler keeps you compliant automatically. All the entries are automatically filled in. Just print and send to OSHA. Its that easy! Gone are the days of paper time sheets and carrying around badges. With FaciliTrack, it's easy to document time in and time out. We know how essential it is to keep accurate records and understand that it can be difficult to do in a busy work environment. FaciliTrack's GPS-based system is a simplistic way of tracking how long contractors spend on a job site. Integrated and easy to use, FaciliTrack ensures accuracy and timliness when it comes to recording hours. 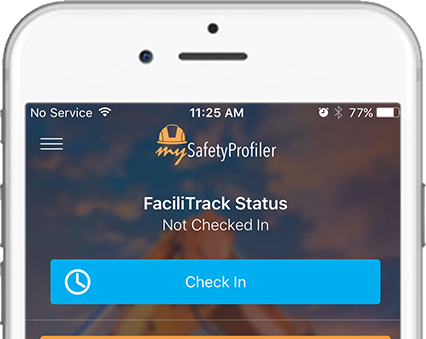 Simply swipe left to check-in and right to check-out and FaciliTrack will provide a live report documenting hours worked and breaks. You can also use to figure out where exactly incidents occur. 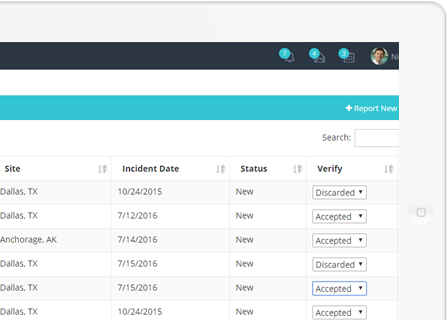 filing and tracking incidents has never been so easy. Thank you mySafetyProfiler, our employees appreciate it!." "The functionality and interface of the app is extremely easy to use. Very impressed with all the features. Unique concept, great design and overall a very useful app."